국보 제137호 대구 비산동 청동기 일괄(2014년 국보 동산 앱사진). 대구시 북부 비산동에 있는 초기철기시대 무덤유적에서 나온 유물이다. 동검은 전형적인 세형동검으로 칼 끝이 예리하고 칼몸 끝까지 등날이 세워져 있다. 모양은 가운데 마디가 있고 칼자루 끝에는 물새 두 마리가 머리를 돌리고 서로 바라보는 모습을 하고 있다. 이러한 장식은 이미 평양부근에서 출토된 적이 있는 것으로 북방지역 청동기 문화와의 연관성을 나타내고 있다. 검은 색조의 청동검은 칼자루의 표면은 광택이 있으며 그 밖의 다른 세부 조각이나 장식은 없다. 이외에 부속품으로 칼자루 장신구, 칼집부속구, 칼끝 장신구 등과 기타 파편들이 있다. 칼자루 장신구는 평면이 은행알처럼 생긴 타원형 장신구로서 둘레에는 평행선무늬가 연속해서 새겨져 있다. 칼집부속구는 청동으로 된 타원형 고리로, 목재 칼집을 보강하고 장식하기 위해 사용된 것으로 생각된다. 칼끝 장신구는 길이 3.75㎝, 밑변길이 2.9㎝로 나무로 된 칼집의 끝에 장식한 것이다. 그 외에 칼자루로 생각되는 파편 1점이 있다. 이 동검은 칼과 손잡이 칼끝장식이 별개로 만들어진 점으로 보아 제작자가 한반도 남쪽 지방으로 추정된다. 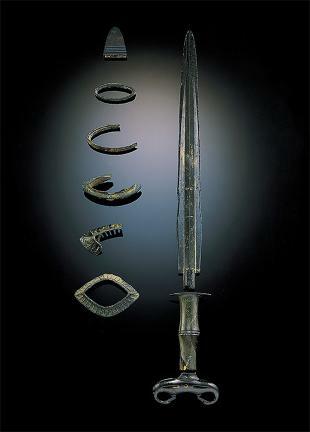 These are relics found from a tomb in Bisan-dong, Daegu, dating back to the early Iron Age. The sword is a slender bronze dagger commonly found on the Korean Peninsula, and its tip is sharp. It has a node in the body, and the end of the handle is inscribed with the shape of a pair of water birds looking at each other. Swords with such design were unearthed near Pyongyang. It indicates their association with the Bronze Age culture in the north. The sword handle is glossy, displaying no detailed engravings or adornments. 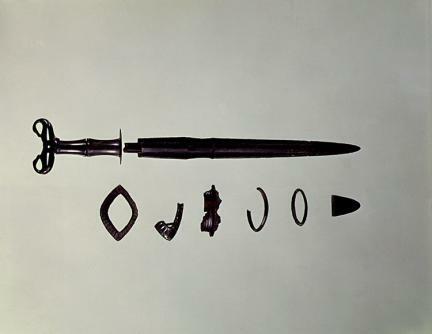 Other accessories found together with the sword include handle accessories, sheath ancillary parts, sword end accessories, etc. The sword end accessories are shaped like gingko fruits inscribed with repeated parallel lines on the surface. The sheath ancillary parts are oval-shaped bronze rings. The sword end accessories (overall length: 3.75㎝) are attached to the end of the wooden sheath. The sword is presumed to have been made in a southern region of the Korean Peninsula, judging from the fact that the handle and the sword tip accessories are separated from the sword.